In this remarkable 2007 video, Barack Obama pledges to an anti-war group that he will eliminate and severely reduce America’s nuclear arsenal. He also promises not to weaponize space and that he wants a world without nuclear weapons. Now that’s a nice thought. Wouldn’t we all like that? There’s just one problem…there are a number of rogue nations (North Korea, Iran, etc) that have the ability to make a nuclear weapon. So, do we honestly believe that if we eliminate all of our nukes, that they’re going to do the same thing? Give me a break. If Obama and his “progressive” followers don’t want America to be the worlds lone military superpower, then who do they want leading the world? China? North Korea? Oh yeah, the world would be much safer under them. If we’re not the world’s military superpower, somebody else will be. There are plenty of nations ready and willing to take our place. If you think back to September 11th, 2001, could you have honestly believed that America would have lasted nearly 7 years without another major attack on our soil? Most of us believed (including me) that it would be two and maybe three years at the most before we were hit again. Because of President Bush’s leadership we have lasted this long and America has nearly completely dismantled the Al Qaeda network. We’re winning the war against terror. We’re winning the war in Iraq. We removed the Taliban. We removed Sadaam Hussein. Al Qaeda is utterly ineffective and losing to us on every front. Why would we stop now? Because we have hope and we want change? Barack Obama will bring change all right–from winning against terorrist to losing against terrorists; from being the world’s lone superpower to not being a superpower; from being strong to being weak. Oh yeah, that’s change I can believe in. 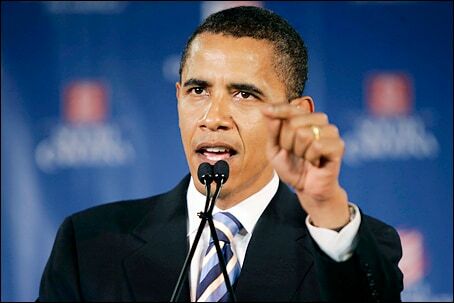 On Tuesday, Presidential Candidate Barack Obama called for the US to talk to Iran to help sort out the Iraq situation. Which, if you think about it, is pretty funny considering that Iranians are probably largely behind the majority of attacks on US troops in Iraq. What would talking to a clown like Mahmoud Ahmadinejad accomplish? Likely nothing other than embarrassing the United States for negotiating with a communist nation and bowing to their desires. Iran has a vested interest in what happens in Iraq. Iran would like nothing more than to turn Iraq into a nation much like Iran. Iran does not want any kind of democracy in the Middle East and will be a major opposing force to any kind of democratic government for a very long time. Sure, Iran could stop a lot of the violence in the region because they’re the cause of most of it. In case Obama hasn’t noticed, Iran is a state sponsor of terrorism. Iran would gladly “help” us quell the violence and in exchange get to exert more influence on Iraq and dictate where oil profits go. Why don’t we just open up negotiations and unilateral talks with Al Qaeda? Maybe we should “talk” to Iran about the 6000 new centrifuges that they are assembling for their nuclear program. I’m so sure Iran’s only interest in uranium is for nuclear power….does anyone actually believe that?